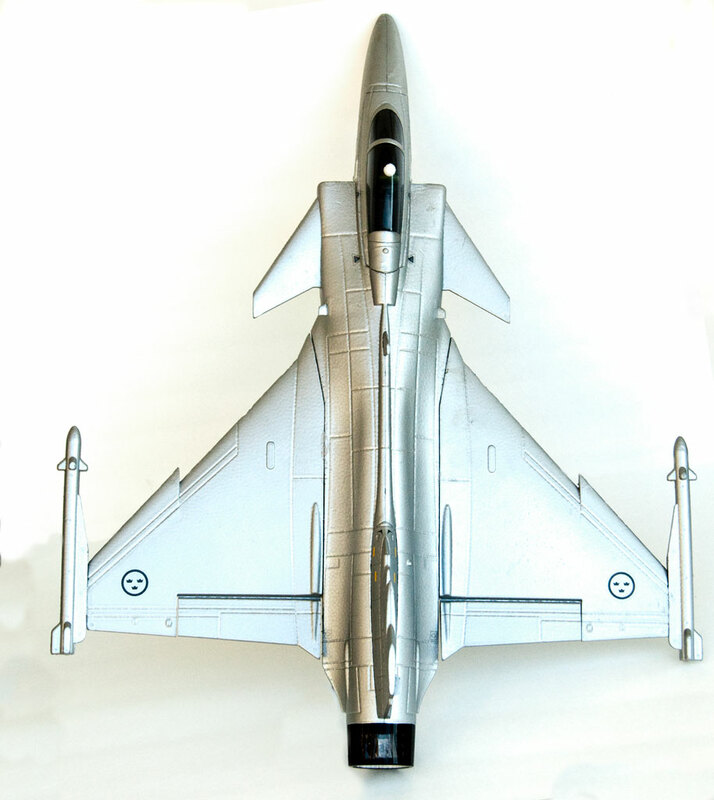 It all started with my JAS-39 Gripon (retired). After a serious nose-in, it’s nothing more than a twisted hulk of foam that I trip over occasionally. But I noticed the wings were still in pretty good shape. What if, I wondered, I pried them off and stuck them together? 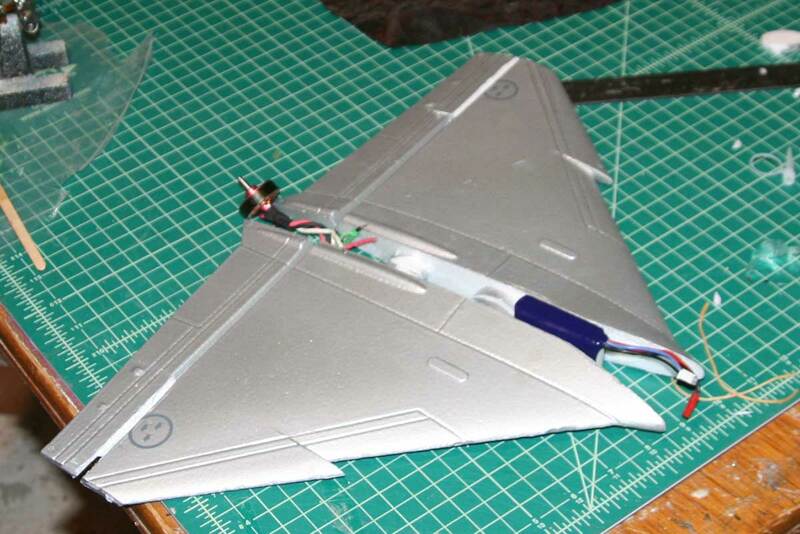 Could I stick a motor in the back and make a tiny flying wing? I actually thought it looked super-cool. I chopped the elevons up to make room for a propeller. Then chopped them up some more. Then decided that this should really be a tractor delta, rather than a pusher wing, so I had to glue them all back together again. 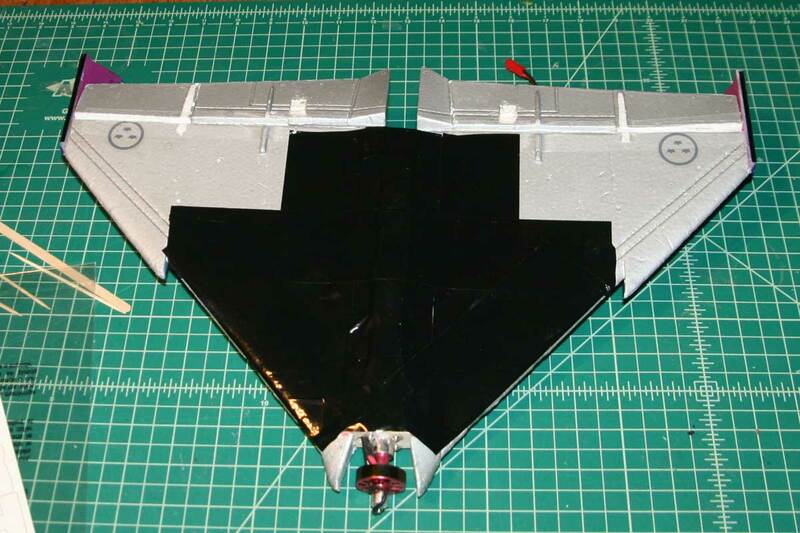 The wings didn’t quite fit together, as they have some raised ‘tabs’ that originally fit into holes in the fuselage. I decided to retain the space in the middle to mount my equipment in. I a bamboo skewer through each set of tabs to hold everything in alignment and create some internal spars. I made a firewall out of some plywood and stuck it in the front, then mounted a Turnigy 2730-3000 outrunner (from a destroyed Adrenaline Rush) to it. 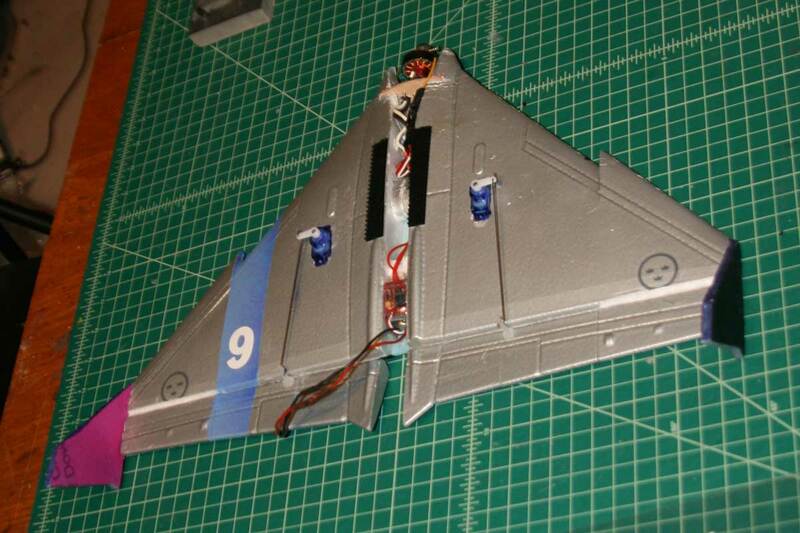 I didn’t want the servos dragging on the ground, and the 6 gram servos I’m using didn’t fit the original pockets anyway, so I cut new holes in the wing and mounted the servos vertically in them. Here’s a top view where you can see the round ‘tabs,’ and the empty center space they create, pretty well. 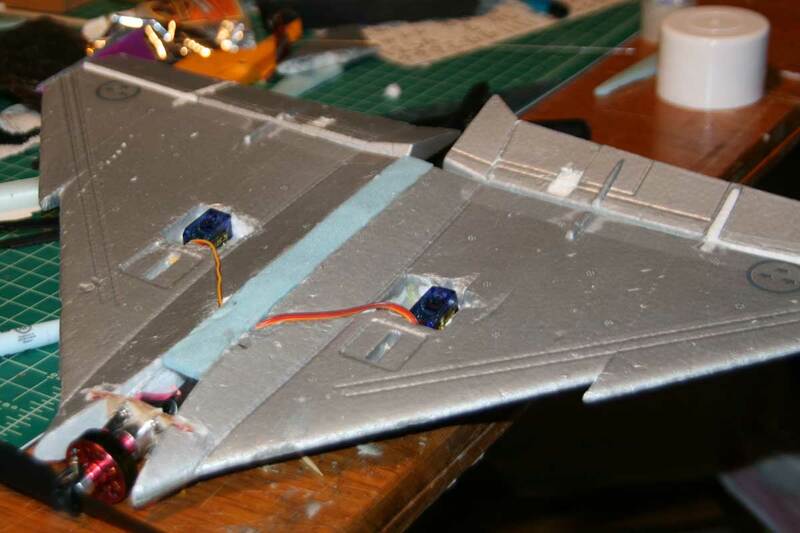 I used blue fanfold foam to fill the gap in the bottom of the wing. 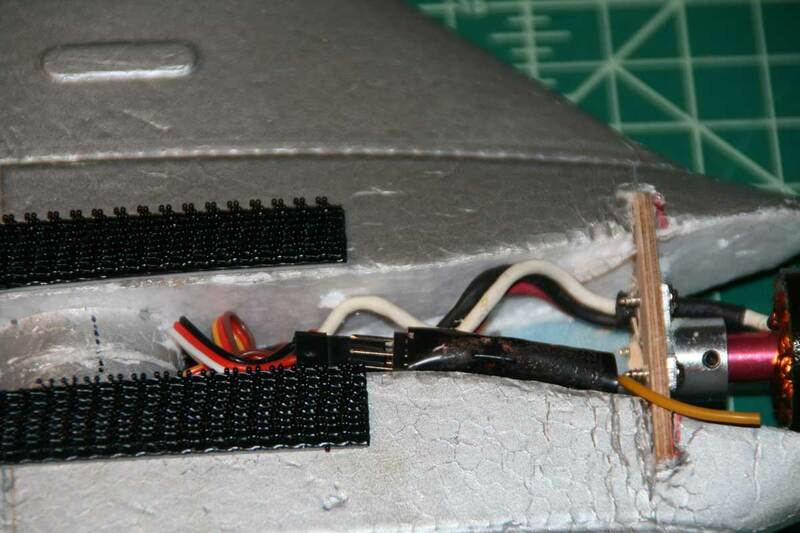 You can see the little 6gram servos sitting in their giant, empty pockets as well. 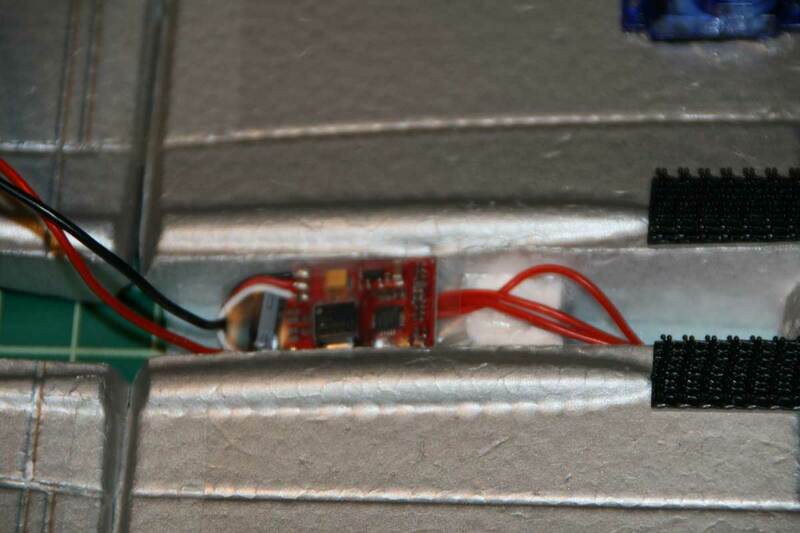 This gets covered up with tape, along with the empty servo sockets. The receiver sits up front, behind the firewall. 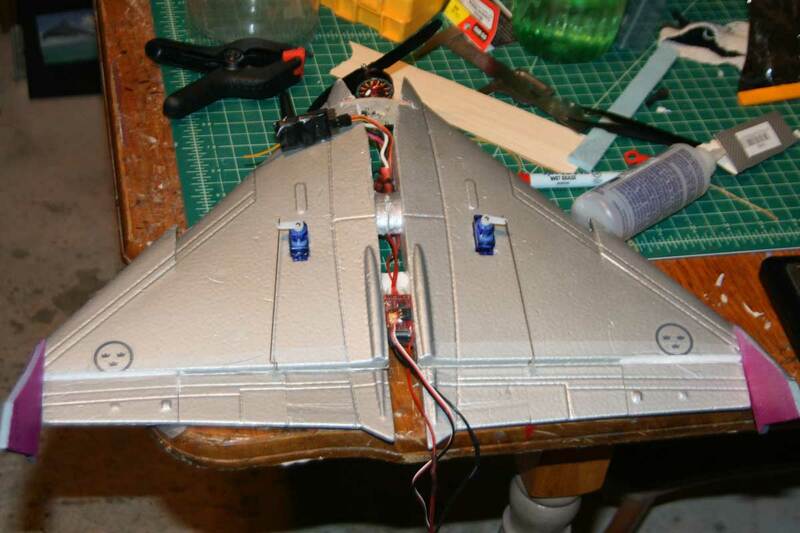 The ESC sits in the back I made winglets for the rear of the wing. 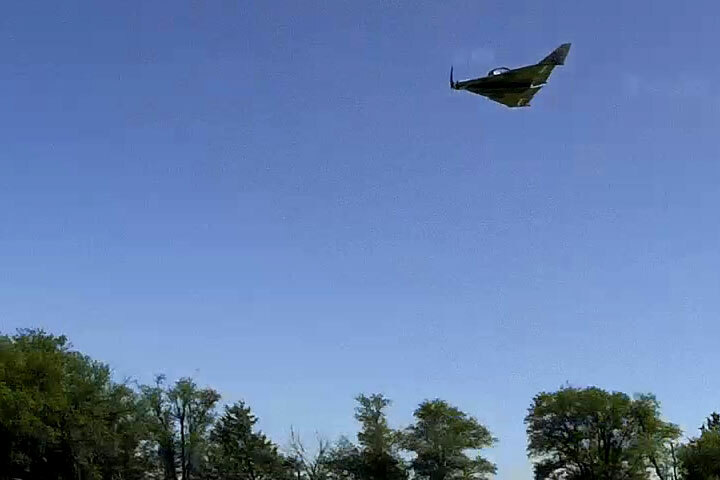 They are modeled on the original Gripon’s canards, but made of blue fanfold foam. I ran two strips of “Velcro” down the gap on the top, to temporarily mount my battery while I try to work out the best CG for the plane. 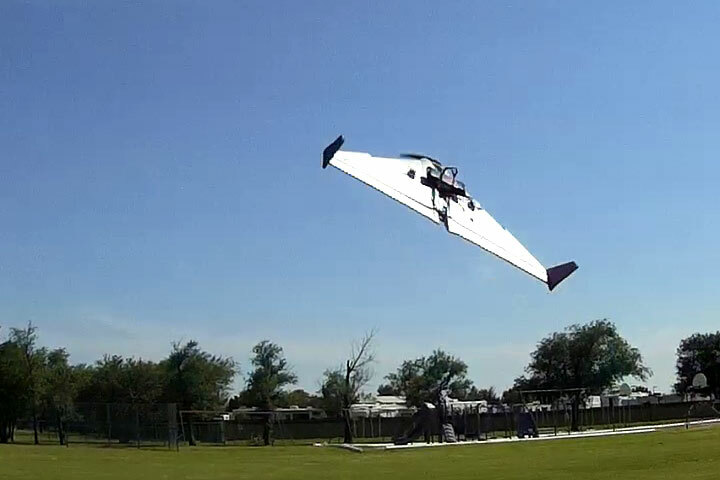 With a 17″ wingspan, it weighs 4.4 ounces without a battery. AUW with an 850mAh 2-cell is 6.2 ounces. 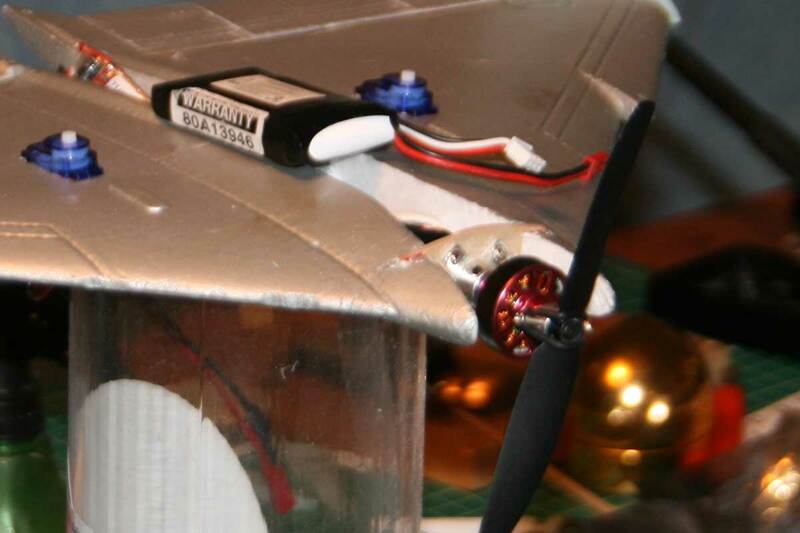 With a 5×3 prop, it develops 12.2 ounces of thrust and goes in the neighborhood of 50MPH. It will roll at a ridonculous 200 RPM. 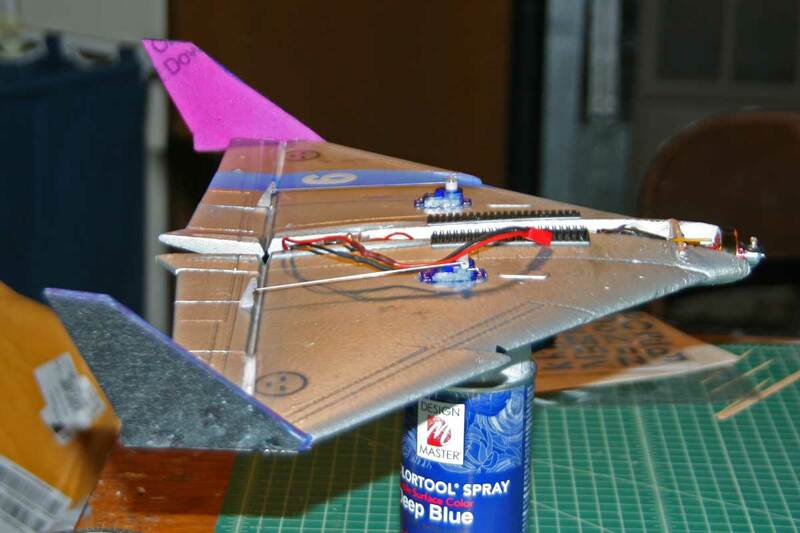 This entry was posted in Build Threads, Building, Custom & Modified, Flying Wings, R/C Planes. Bookmark the permalink.